Weather getting warmer in April and the turnouts are getting better. 20 Hunter's Pistol Silhouette relays fired at Chuluota Sportsmen's Club on Sunday 4/8. Some good scores turned in both bigbore and smallbore competition. Joe L, visiting from Wisconsin, had the high overall score for the day with a 30. Greg S led all smallbore shooters with a 26. Lighter turnout for rifle competition, but Mary W's fine 28 was tops there. Special thanks to several club officers for standing in to help Match Director Rod B. Next match will be Sunday 5/13. Saturday, 4/7, Seminole County Gun and Archery (SCGAA) held their monthly IHMSA shoot. 10 participants, but some good scores and light lunch provided by the club. Scores fired during the match can be submitted as qualifiers for the 2018 SCGAA club championship, which runs in April and May. The championship requires participating in at least 3 of the club's 4 regular monthly disciplines including IHMSA Silhouette, Smallbore Prone, Benchrest and CMP Highpower. 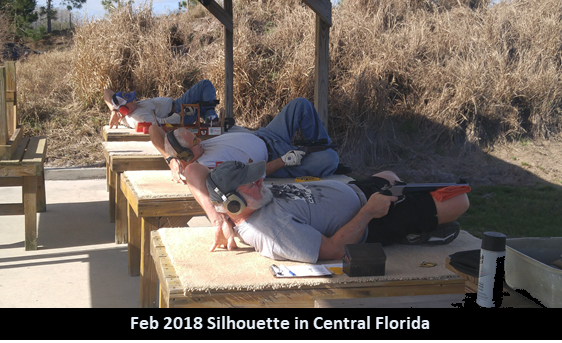 Central Florida Rifle and Pistol Club hosted the Metric Prone Regional Match on the first week of March, 2018. Fifteen shooters participated in the event with two juniors travelling from Lakeland area, Emma James and Kyle. Len Remaly, a veteran four-position shooter from Massachusetts provided the description of weather conditions below. Both match days started cool in the low 50's to high 40's on Sunday, but warmed up to low 70's or so, after several days in the high 70's and low 80's. Some Locals complained about the cool temperatures, but not Massachusetts resident Len Remaly, who was skiing on deep snow in Vermont just before driving south to shoot the match and visit family. As for wind during your match, the first day, the high wind I recorded was about 19.5 MPH, and 26 MPH on Sunday. Both days, winds switched around pretty much all day with 50 yds. flags and wind at the firing point seldom in agreement and mirage hard to read and different from flags. There were some good targets, but everyone had the honor of getting some surprise very wide shots that usually did not correlate with prediction. Shawn Wells shot a fine(metric) 196 to start the (second) Any sight day off with Len Remaly 2 points behind in wind starting to break 15 mph. Great weekend for silhouette in central Florida. IHMSA match in Seminole county gun and archery on Saturday and NRA match at Chuluota sportsmen’s club on Sunday. Warm weather both days for a nice change and the wind wasn’t much of a factor until later in the morning- good especially for small-bore shooters. Good turnouts both Saturday and Sunday, with an added bonus of the swap meet and the boy scouts providing burgers and dogs in Geneva on Saturday. New shooters at both matches, hopefully they’ll become regulars. Many thanks for the extra help with setup both days. The 2017 Dixie Matches were held at Gateway Rifle and Pistol Club, Jacksonville, FL on April 21st - 23rd. This annual National Rifle Association (NRA) Regional Precision Pistol Championship continues to be a highlight for many Florida Bullseye shooters and was also attended by military and civilian competitors from several different states. On Friday, Saturday and Sunday, the weather was near perfect, giving many of the 45 shooters the opportunity to post some very good scores over the three day match. Jim Henderson, a familiar competitor from the Army Marksmanship Unit (AMU) at Ft. Benning, Georgia, fired a 2665-151X to take “Top Gun” honors, winning the NRA Regional championship, and being named Dixie Match Champion. Coming in second, also from the AMU was Greg Markowski, firing a 2663-162X. Chris Hudock, another AMU shooter, finished third with a 2614-116X. Winning the High Master Class was Jason Hedrick, a member of the Marine Forces Reserve, and last year's Dixie Champion, with a 2600-114X. Top shots in the Master Class (Service) was Joshua Kingery of the AMU with a 2538-68X and Master Class (Civilian) was Eddy Grove (Pasadena, MD) with a 2577-82X. Taking the Expert Class was Noel Burkhead (Gainesville, FL) firing a 2463-55X. The high Sharpshooter/Marksman combined was Russ Gill (Apopka, FL) with a 2419-54X. Winning the .22 Caliber Only Aggregate was Lori Fredriksen (Valrico, FL) with a 2225-20X. Special Category Awards for High Service and Open Division shooter went to Jim Henderson (Midland, GA), High Civilian and High Veteran shooter was won by Wes Fleming (New Philadelphia, OH), High Senior shooter was won by Mike Milen (Orland Park, IL), High Women shooter went to Kimberly Hobart Fleming (New Philadelphia, OH), High Grand Senior was won by Eddy Grove (Pasadena, MD). Winning the Metallic Division was Curt Brandt (Safety Harbor, FL). The AMU won the overall team match (a combination of scores from the .22, Centerfire and .45 team matches) with combined total of 3476-148X. Taking second place was a Service team from the Marine Forces Reserve, firing a 3162-70X. There were four Civilian 2 person teams entered, with the winning team of Lee and Wes Fleming firing a score of 1705-53X. The NRA Distinguished Revolver Match had 21 shooters competing. Winning the match was Greg Markowski (Columbus, GA) firing a 278-7X, followed by Jason Hedrick (Williamsburg, WV) with a 278-5X and finishing third was Greg Kitchens (Charleston, SC) with a 272-6X. The CMP Service Pistol Match had 26 shooters, and was won by Jim Henderson with a 296-14X, followed by teammates Greg Markowski shooting a 286-8X and Chris Hudock finishing third with a 284-11X. In only its third year of existence, the CMP's .22 Rimfire E.I.C. Match had 30 shooters competing. Winning the match was Greg Markowski with a 291-13X, followed by Chris Hudock shooting a 286-9X and Joshua Kingery with a 281-7X. Finally, three new range records were set. Jim Henderson broke his 2007 Center Fire Slow Fire record, by shooting a 198-11X and also broke his 2012 CMP Service Pistol E.I.C. record with a score of 296-14X. Greg Markowski set a new Center Fire Timed Fire range record by shooting a 200-19X. The annual Dixie Match remains one of the best Bullseye matches in the southeast and continues to attract more shooters. Among our first time competitors were collegiate shooters from The Citadel (Charleston, SC). Match Director was Ted Carter. Calling a superb line for all three days was Chief Range Officer John Michalski. Assisting John to ensure a well run and safe line were Range Officers Marion Estes, David Poole, Larry Watkins and Dave Rifkin. Randy Erickson assisted as Jury Chairman and provided logistical support for the match. Recording and posting all scores were Chief Statistical Officer Sue Carter, assisted by Dana Baygents. There were plenty of complements from the competitors on the excellent Bullseye facilities at Gateway and the friendly, professional and safety conscious staff. Many thanks to all the competitors for their support, some driving hundreds of miles to attend the match. A special Thank You to Brownells Inc. and Rand CLP for generously providing merchandise prizes for our match. Finally, a well earned thanks goes out to the Dixie match staff, the Gateway range officers, office staff and the range maintenance folks who made this another great shooting event. Planning has already begun on the 2018 Dixie Match and we're looking forward to another exciting competition. Saturday November 21: The day was overcast, ridiculously humid and hot. On the other hand, there was no wind. None. Which is not at all normal for a Florida November. After the squadding and safety briefing, Richard Dixon started off the colors ceremony with a salute charge from his model cannon. From there we got the ball rolling at the 300 yard line almost on time. Competition started on the deceptively tough MR63 targets. In the any/any rifle category, it was a horse race between the five High Masters. Tom Ziel came out on top with a phenomenal 200-17x, but only one point separated the HMs. The scores were close between the any/metallic sight rifles as well, once again between the HMs. Ken Orris came out on top with the only clean at 300. In the Service Rifle category, Duke Boele and Mario Fajardo were neck and neck until it happened: Duke cross fired an X. That left Mario a full ten points ahead after 300 yards. 500 yards on the MR65 target was next. The 500 yard line seems to vex most shooters for some reason, but not Ziel. He shot the only clean at 500, with a double digit X count to boot. The point spread was a bit larger for the any/any’s on this yard line as well, but still close enough that the outcome was still in the wind. Carl Weston took the 500 line from Orris in the Metallic Sight gategory, but only by Xs. For SR, three competitors started clawing their way back towards Fajardo, but he maintained an eight point lead. Other than the unrelenting humidity, one could not ask for a better opportunity to shoot a clean at 600 yards. There was so little wind and so much humidity that the competitor’s glasses were fogging. Tom Ziel took full advantage, and steered his 6BR chambered rifle to a 10X clean, thereby shooting the only perfect score of the day for an aggregate score of 600-41. He was unflappable throughout the day, even at the end when he took his time executing those perfect shots while the other competitors were chatting and removing gear from the line around him. Brian McElhaney shot the high score on the 600 yard line with his metallic sight 220 Thunderbolt space gun, a 200-12. But even so, it wasn’t enough to catch Carl Weston’s 596-33. Fajardo’s commanding lead at 300 carried him through to the end, where he sealed his win with a comfortable five point margin. Sunday November 22: The match was postponed until December 19th due to the rain. There was already a Leg Match scheduled for Sunday December 20th, so that works out nicely for the Service Rifle shooters who are still in the hunt for the Distinguished Rifleman medal. Many thanks to Jeff Stuart for organizing these matches and doing the stats, and to Bob Faustino, who gave up shooting to run the pits for us. The FSSA would also like to thank Port Malabar Rifle and Pistol Club and Rifle Director Francois LeBreton for hosting us again. An extra special thanks goes to Richard Dixon and Nick Mocca, who gave up chances to practice and get zeros to repair and reface the targets just for this match.